Here in the UK we have had more snow than we have seen in over 20 years and as a country we are struggling with it to say the least. I have friends in places such as Finland who think that all this is rather funny…it takes nothing more than a bit of snow to bring the UK to its knees. 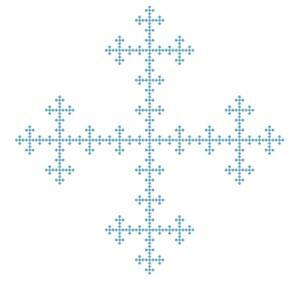 Anyway…all this talk of snow reminds me of a Wolfram Demonstration I authored around Christmas time called n-flakes. It started off while I was playing with the so called pentaflake which was first described by someone called Albrecht Dürer (according to Wolfram’s Mathworld). To make a pentaflake you first start of with a pentagon like this one. The final result is the first iteration of the pentaflake design. 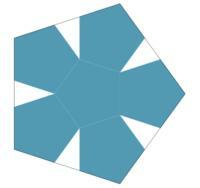 Take a closer look at it….notice how the outline of the pentaflake is essentially a pentagon with some gaps in it? Lets see what happens if we take this ‘gappy’ pentagon and arrange 5 identical gappy pentagons around it – just like we did in the first iteration. Which is very pretty I think. 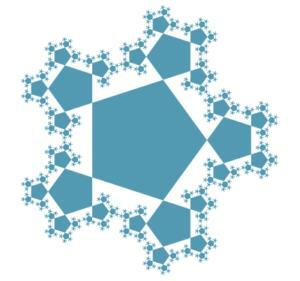 Anyway, over at Mathworld, Eric Weisstein had written some Mathematica code to produce not only this variation of a pentaflake but also another one which was created by putting pentagons at the corners of the first one rather than the sides. Also, rather than using identical pentagons, this second variation used scaled pentagons for each iteration. The end result is shown below. So I did and the result was named N-flakes which is available for download on the Wolfram Demonstrations site. Along with pentaflakes, you can also play with hexaflakes, quadraflakes and triflakes. One or two of these usually go by slightly different names – kudos for anyone who finds them. Albrecht Dürer was a 16th century German artist. 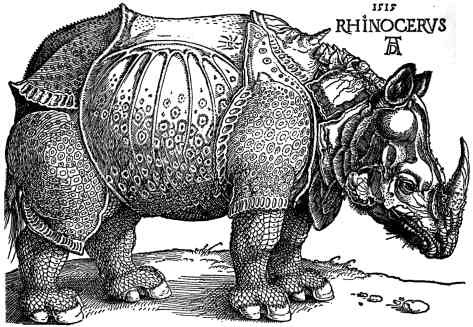 Check out his rhinoceros, drawn from description (he never saw one). I’ve always liked him, but in the light of this post I might also have reconsider him the Escher of his day! Thanks for the info – I’m loving the rhino pic. I hadn’t heard of him until I started looking at pentaflakes – I wonder if he came up with any other mathematical constructions? Check out his Melencolia I, which famously contains a 4×4 magic square. Beautiful fractals. I’ve always been transfixed by the pentagon. Now I’ll probably spend the rest of my weekend photoshopping them. Thanks. A friend of mine made similar images using L-systems.